A good quality wool blanket can be a fantastic investment that will last for years, and help to keep you comfy and warm in the winter. The itchy wool of your childhood is mostly a thing of the past, replaced by new merino, alpaca and soft options that offer all of the good things that come along with wool blankets without the sometimes harsh, scratchy feel. 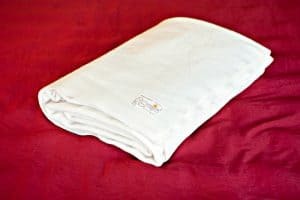 In case you are wondering why these types of blankets are loved by so many, some of the top reasons include being hypoallergenic, fire resistant, and they help regulate your body temperature making it more comfortable to sleep in a variety of different temperature levels. There are a lot of wool blankets on the market, some more comfortable than others. We have found those that are soft, cozy and not itchy for most people. Pendleton is one of the very famous U.S wool mills that is still operating. They have a lot of classic blankets that they sell, but you have to be a little bit careful when choosing the right one. Most of Pendleton’s most popular products are kind of old school and tend to be a bit more coarse than some people will like. If you are looking for comfort, one of their best all-around choices is the Pendleton Easy Care Wool Washable Bed Blanket. It is a 100% Pure Virgin Wool design that is not only soft, but it is also machine washable, which is quite unusual for a pure wool blanket. It is made in the U.S and comes in 8 colors. You can get it in a twin, queen, or king size, and the sizing is entirely accurate for standard bedding. It is a warm option for the winter if you use it as a layer, or for the summer as a cover. 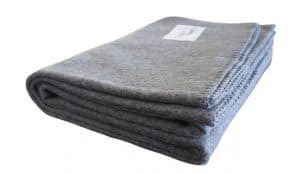 The Pendleton Easy Care is an excellent choice for those who find regular wool blankets either too much trouble to dry clean or don’t want to have the extra cost of dry cleaning. Most users find that it does wash thoroughly and gets softer the more you wash it. It is worth noting that the Pendleton Easy Care is a little stiff and somewhat scratchy when you first get it, but as long as you wash it as instructed, the texture will change and soften up. Another Pendleton design that is known for its comfort is the Heirloom. The Heirloom is a merino wool design that you can get monogrammed or embroidered for a more personal touch. It is slightly more expensive than other styles, but it is a favorite for people who are looking for a long-lasting, high-quality gift. Woolrich is another one of the big U.S traditional wool companies that offer some beautiful, high-quality heritage designs. 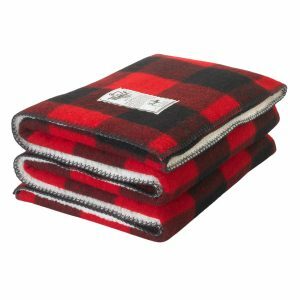 I don’t think they are made in the U.S anymore, as unfortunately, the company shut down its last U.S mill in Woolrich Pennsylvania at the end of 2018, although presumably they still have made in U.S.A blankets in circulation. Regardless, Woolrich is still known for their high-quality products, particularly the Original Buffalo Check plaid (that is pictured above). They offer two soft designs worth considering if you are looking for comfort: the Rough Rider Sherpa and the Seven Springs Blanket. The Woolrich Rough Rider Sherpa is an exciting mix of traditional wool matched with cozy soft fleece. The Rough Rider Sherpa is a tiny bit smaller than a twin (50 by 60), so it is more of a throw style that is good for snuggling up on the couch, rather than something you would put on your bed. 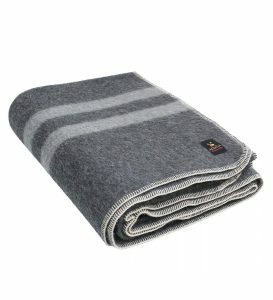 The other Woolrich option you may want to have a look at is their Seven Springs Blanket. It is made from a fine-grade, soft-hand wool that can be used for indoor or outdoor use. They come in bright fashionable colors and are known for being very soft and very warm. The sizing is 56″ x 70″, which is a little on the small side and is another one that is perhaps more of a throw than a bed style. Both designs are good choices if you are looking for a very well made product from a reputable traditional brand. A trendy, luxury product that will help stylishly cover your bed is the Coyuchi Striped Wool Blanket. This design is made from wool that comes from very fancy sheep up in Canada. These blankets are not only beautiful looking and come in nicely matched color combos, but they are very soft to the touch and manage to be both lightweight yet warm. The blanket is made at a small, family-owned mill that has been operating since 1870 (so they have a little bit of experience). The wool is sustainably produced and nicely crafted, although at first, it is a bit rough, after some washing and air drying, it softens up. Coyuchi offers this design in queen size or a throw size, with the queen being a little on the small side, which may be an issue if you want to tuck it in. Faribault is one of the last two remaining wool mills operating in the U.S, so their products are still made in the USA. 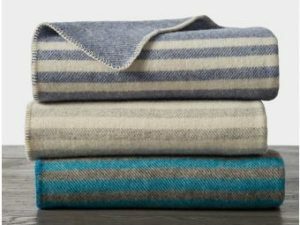 The Faribault blankets are known for being high-quality, ultra-soft, naturally warm, and are so durable that they will probably outlast you. Faribault has a lot of different styles to choose from, so you may want to start by checking out the Pure & Simple Utility Blanket. This design is known for being soft, lightweight and easy to move around. One interesting thing to note is that it is made from 75% leftover virgin wool and sewing scraps, making it more environmentally sustainable than some of the other options on this list. 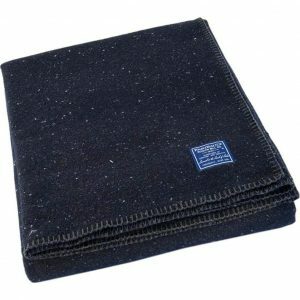 It also has 25% polyester in the blend, that helps create the toughness that you would expect from a Faribault product. Along with Merino or special soft wool, you should also check out Alpaca. Alpaca is also very soft and can be an excellent alternative to sheep’s wool. One Alpaca design to consider is the Putuco Thick Alpaca Blanket, it looks great, gets excellent reviews on Amazon, and isn’t overly expensive. Alpaca is a fiber that is similar to wool in that it is hypoallergenic, but it is warmer and softer with none of the itchiness that you can sometimes find with sheep’s wool. It has a kind of silky, smooth feel to it that people love. The Putuco Alpaca design is indeed worth a look if you are concerned about warmth, comfort, and durability. As for the practical, this design comes in king, queen or twin, is made in Peru and comes in a nice variety of colors. If you have clicked on any of the links above, you will have probably noticed that most of the above-listed products aren’t cheap. It is pretty standard to spend around $200 or more on a good quality option. Some brands can go as high as almost $500 (I’m looking at you Hudson Bay Blanket!). Anyway, if a $200 blanket doesn’t quite fit into your budget, one option you may want to consider is the Woolly Mammoth Woolen Company Wool Camp Blanket made from virgin merino wool. People who own this product find it great for camping, hiking, boating, or indoor use during the winter. It is 66″ inches x 90″ inches, so it’s the right size for a variety of activities or purposes. A lot of reviews comment on the smell of this blanket, in a good way though, like it is pleasant smelling and it smells like real lanolin. It is probably one of the thicker options on this list, but it is described as being very soft and high quality. Be aware that this style is dry clean only. Self Regulating – If you find you get overly hot or very cold when you are sleeping they will help you regulate your body temperature making it easier for your body to ‘breathe’ so you can stay warm in the winter and cool in the summer. Hypoallergenic – They are also great if you suffer from allergies as they are hypoallergenic. They are dust mite resistant and won’t get moldy or attract bacteria. Fire Resistant – If you like a blanket for camping, rest assured that you will be safe by the campfire since they are also fire resistant giving it an extra added element of safety. Weight – Wool comes in a variety of different weights, depending on what you are planning on using it for, you will want to check product specifications on whether it will be lightweight, mid-weight or heavyweight. Type – Not all blankets are created equally, so when you are shopping for comfort you need to be extra careful in selecting a type of wool that will be soft and not itchy. Generally, the softest types to look for are virgin, Merino, Alpaca, and cashmere. Dry Clean Only – A lot of people are turned off anything wool related since the standard perception is that it is dry clean only. These days that isn’t necessarily the case. Some products are still dry clean only, but since wool is naturally resistant to dust mites and mold, realistically you shouldn’t have to be cleaning them all that much anyway. They are often described as self-cleaning, although if you have pets or tend to be a little messy, this may not apply. If dry clean only is a concern for you, there are a few options that are washable including Shepherd’s Dream designs and the Pendleton Easy Care. 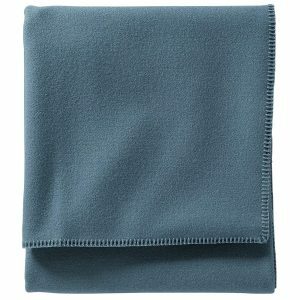 Made in the U.S.A – Wool blankets are one of the few items that you can still easily buy that are made in the U.S. If this is a concern for you, you will want to start your shopping at either Pendleton or Faribault Mills. You can also consider Woolrich (older styles that may still be being sold) and Shepherd’s Dream. Budget – For a good quality, well-made blanket, expect to pay somewhere in the $200 price range. The cheapest option on our list is the Woolly Mammoth Woolen Company Camp Blanket that you should be able to find for under $100. Longevity – If you invest in a good quality wool blanket, chances are that you will be able to pass it down to other members of your family. They last that long.